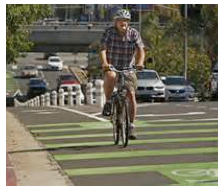 GUEST WORDS-On Sept. 2, 2015 the Silver Lake Neighborhood Council voted to “reconsider” its support of the recently-passed Mobility Plan 2035 for the City of Los Angeles. The plan, which places safety at the center of all transportation decisions instead of vehicle travel speed, has been a favorite target for conservative talk radio hosts, “Fix the City,” and now some Neighborhood Councils who favor the reverse. Three Councilmembers are pushing amendments that would gut the plan in their districts. Councilmembers Curren Price and Paul Koretz are each proposing removing planned bike lanes from Central Avenue and Westwood Boulevard. Both of these streets are designated as “Great Streets” by the L.A. Mayor’s Office. Taking bike infrastructure off the table on Westwood and Central seems a direct challenge to Vision Zero and Great Streets and the soaring rhetoric of Mayor Eric Garcetti. These amendments were tabled in August, but a report on their projected impact is due later this month. Because the last City Council Transportation Committee meeting in September has been cancelled, and its schedule falls on the first night of Yom Kippur, these proposals will likely be debated again in October. This is where the Neighborhood Council opposition could become important. It is unlikely that Ryu will take a stance against the plan in his district. But, if he hears enough noise against the plan, might he consider backing Koretz, or Price, or even Cedillo. It’s doubtful that Silver Lake and Mar Vista have the only neighborhood councils that are either reconsidering support for the plan or looking at it for the first time and having some concerns. Will this be enough to see any changes to the vision outlined by Garcetti and supported by the City Council for a safe multi-modal future? Time will tell, but the first test of the city’s resolve could come before the end of the fall.